I wanted to let you all in on a project I've been working on!! BasicGrey recently announced that they are releasing quilt patterns to go with their beautiful fabric collections. The great team @ BG designed the quilts & I wrote the patterns. Yup... me! Long story short... 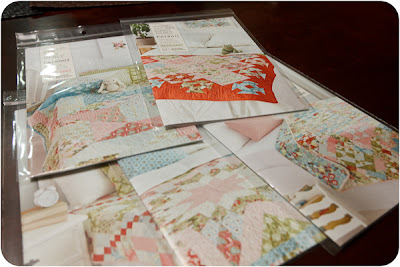 I was a technical editor for a few pattern designers before starting Jaybird Quilts. I stopped doing it once I developed my own pattern company, but I couldn't say no when my friends at BasicGrey asked for my help. 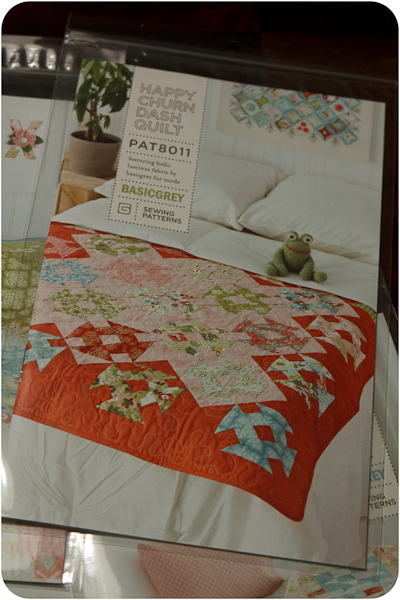 The patterns have the famous Basic Grey aesthetic with the bonus of the writing quality you have come to know with Jaybird Quilts Patterns! 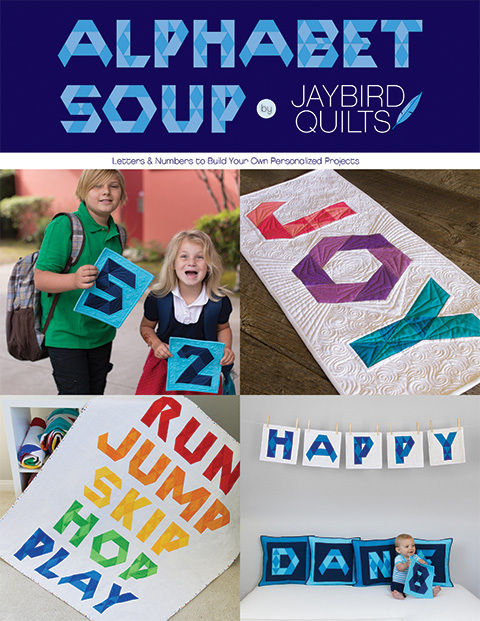 Just like my Jaybird Quilts patterns they are printed in full color and they have size options!! There are currently five patterns in the collection with a pillow pattern that you can download for free. Star Fall Pillow Pattern. 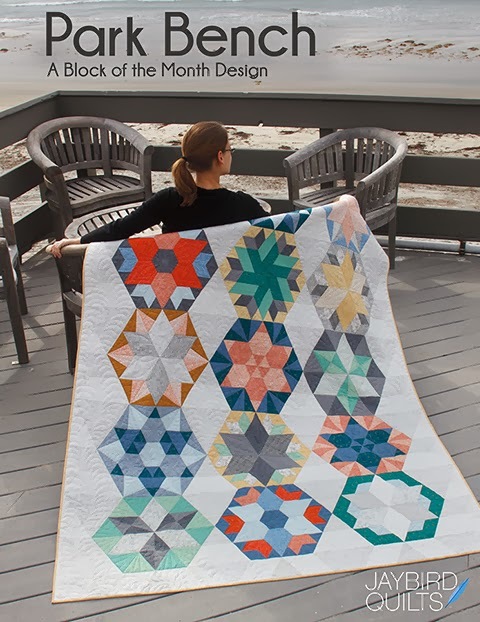 There are also two patterns in the works for Blitzen, their holiday line due in shops in June. And more to come after that!! If you are interested in purchasing these patterns you can find them in Local Quilt shops & online. BasicGrey and I have collaborated before. 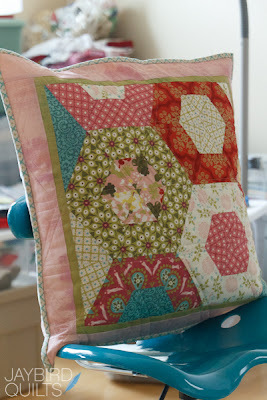 They featured my Jawbreaker pillow in Hello Luscious in their booth at fall quilt market. 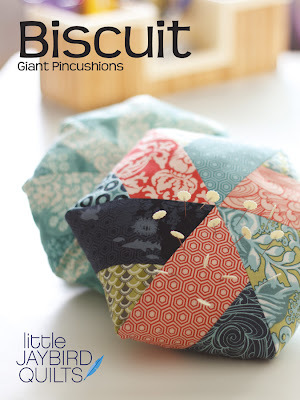 They also had a few of my Biscuit pincushions in their booth, and I featured one on the pattern cover. 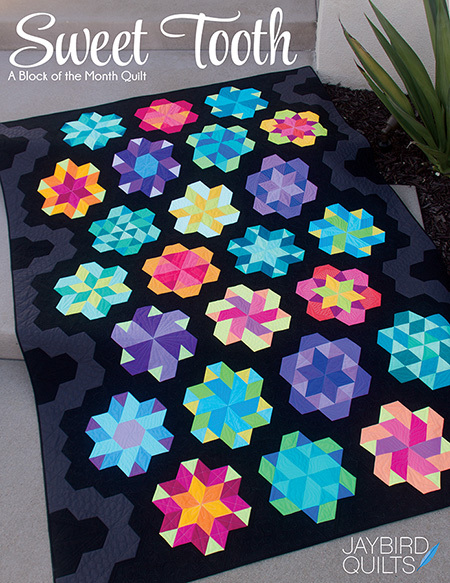 I also have a new pattern in the works for quilt market using their next collection! 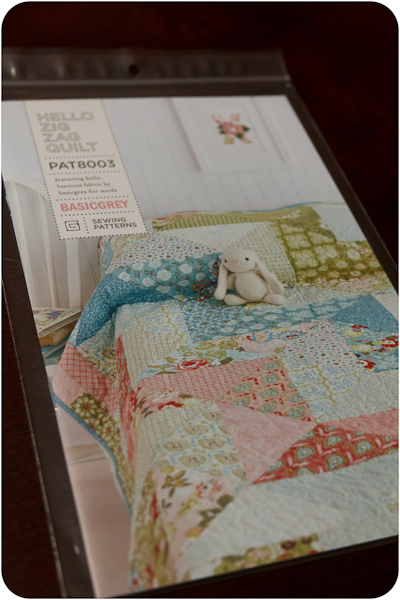 Hello Luscious is their fabric collection that is in stores now. They have designed 5 patterns to go with it! 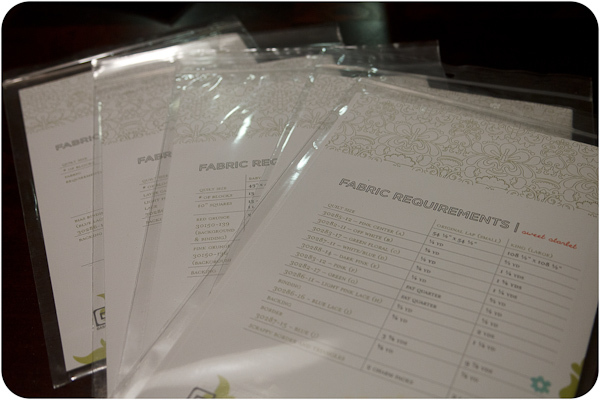 The back of the patterns show all of the fabric requirements for the various sizes. 2. Tell me which of the 5 patterns above is your favorite. --You have until 10PM PST time tomorrow, Tuesday April 17th to enter!Giveaway now closed.Winner announced here. Happy Zig Zag looks, well, so happy! I love them all, but my favorite is the Happy Zig Zag pattern. Thanks for the opportunity to win one. Great gig Julie! My favorite is Sweet Starlet! I really love all the patterns, but since I have to make a choice, I really am drawn to Zig Zag as well as many others. Thanks so much for the opportunity. I think Sweet Starlet is my fave! I'm having a hard time choosing between Promenade and Happy Zig Zag! I'd have to choose Happy Zig Zag. They are all beautiful! I Love them all... but sweet starlet must be my favourite! Sounds like a fun new job! All the patterns look great, but my favorite is Sweet Starlet! Beautiful! Nice job! I love Sweet Starlet! Thanks for a great opportunity! Oh Julie! I am so happy to know that you are the tech writer for these patterns... I saw that they were going to be coming out and I loved each and every one of them. I in particular love the Sweet Scarlet/star pattern. I want that for my bed. Not many things that I make are made for me!!! I always love BG lines of fabric. They can do no wrong. Please enter my name into the hat!!! They are all beautiful quilt. I would say my favorite is promenade. My favorite is promenade. Thanks for the chance to win, fantastic patterns. It's a tough choice, but I'm going to go with Hello Zig Zag. Love those angles! Love that star on Sweet Starlet the best I think, but they are all great! I think m favorite is promenade with a close second to sweet starlet. Wow, you constantly amaze me. They are very lucky to have you. My favourite is Sweet Starlet. Thanks for the giveaway. I <3 Sweet Starlet!!! Thanks for the opportunity!!! So exciting! I love the Promenade pattern. LOVE the pattern promenade - just too beautiful. Thanks for the chance, Julie. I love the hello zig zag pattern! Promenade is my choice. All are nice! Oh my goodness they are all so beautiful, but if I had to choose one I think I am really liking Promenade. Definitely the Hello ZigZag pattern! I love a zigzag, and that is beautiful! If I had to pick only one (hard!) it would have to be sweet starlet. They are all so pretty! If I have to pick a favorite, maybe Sunday Basket Brunch. What a great bunch of patterns....for me the stand out is Hello Zig Zag. What a great giveaway! Sweet Starlet is definitely my favorite! Sweet Starlet is my favorite. Hello Zig Zag is awesome! Promenade is the one for me! Love them all...but the Happy Churn Dash really makes me happy!! I love them all, but I think sweet starlet is my favorite today! Hello Zig Zag appeals the most to me. Thanks for a brilliant giveaway! I absolutely love them all but my favourite is Sweet Starlet! I really like both Hello Zig Zag and the Sweet Starlet. Love that they are doing patterns now. I love all of the fabric lines. Thanks for the chance to win. Mmmm - beautiful patterns! Congratulations on the collaboration - looks like y'all make a great team. My favorite - Sweet Starlet! Oh my! Promenade is my pick! Sweet Starlet is my fav. Sweet Starlet or Promenade - hummmmm - Sweet Starlet! I like Hello Zig Zag. I have a collection of florals that would work great with some solids thrown in. Hello ZigZag is my favorite. Thank you. Love the Promenade pattern. All of them are so sweet but I think Promenade would be my favorite. Thanks for the chance to win! I think I would choose Churn Dash - thanks! Promenade is my pick but they are all lovely. And this line of fabric is fabulous. I loooove the Promenade pattern! It looks stunning! I love Happy Churn Dash..that bright orange is beautiful...thanks! I love all of them but I think Sweet Starlet is my favourite. Thanks for such a great gift away. My favourite is the zig zag quilt. Thanks for the giveaway! Happy Churn Dash for me!! It is so pretty. My favorite is Promenade, but what a great looking bunch they all are! I love Hello Zig Zag! Thanks for the chance to win! Hello Zig Zag is my favorite! How cool! My favorite is Sweet Starlet! Promenade is my favourite! Thank you for this opportunity! You're joking! I was just looking at these at work, and wrote down the ones I wanted to order and teach! 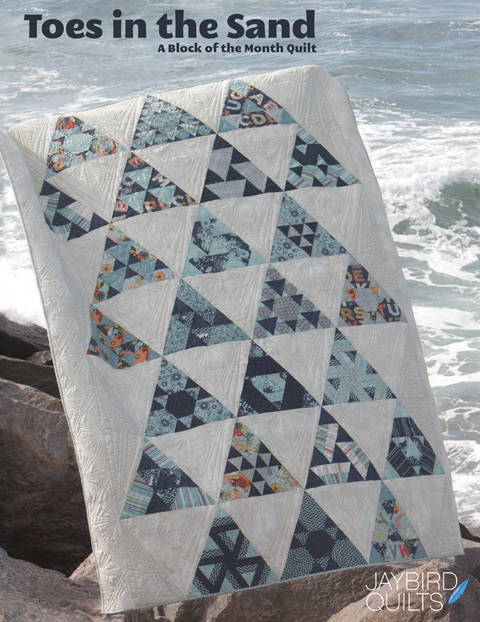 Hello Zig Zag is my fave... and probably the one I'll teach for the people graduating from Quilting 101! Thanks so much for generosity! Sweet Starlet is my favorite. The Promenade pattern is my favorite! Thanks for the chance to win - they all look wonderful!!! My favorit pattern has to be Sunday Basket Brunch! This quilt, well actually all of them just look so happy and homey and snuggly! Sweet Starlet looks, well, SWEET and like it would certainly be fun to make. Thanks for the chance. I just love your patterns!! Happy zig zag looks like a great quick quilt. Sweet Starlet has to be my favorite. Sweet Starlet.....it is so sweet! I couldn´t decide between sweet starlet or promenade. I think promenade looks astonishing in those bright colors. Thanks for the opportunity! I adore the Sweet Starlet. Thanks sooo much for the chance to win! Happy Zig Zag is my favorite. That was tough decision...they all are really pretty. 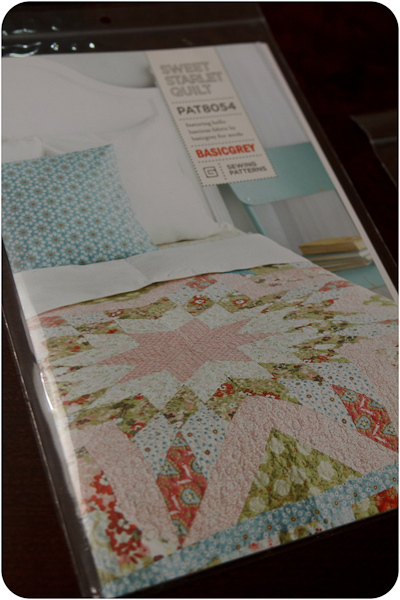 Sweet Starlet Quilt is my favorite. Thank you for the opportunity. I love your blog. I like the Promenade and Happy Zig Zag. Very cute! I love BG fabrics! All the patterns look fun, but I really like Promenade! Oh, they are all so beautiful, but I think Sweet Starlet is my favorite. 8-) Keeping my fingers crossed. I think Sweet Starlet is my favorite! Thanks for the chance to win! Hello Zigzag is my favorite, but they are all wonderful. BasicGrey has fabulous products. It's nice to know someone with experience had a hand in producing these. I love them all, but I am going with zig-zag. I love the Sweet Starlet! (they are all great though). It was hard to choose a favorite, but I'll go with Sweet Starlet. Love the name, too. I like sweet starlet the best :) Thanks for the chance to win! They are all so pretty...but since I have to choose, it would be Hello Zig Zag! Thanks for the chance! I really love Promenade. Thanks for a chance. Great job - all the patterns are wonderful. Oh wow, they are all so lovely!My choice would be sweet starlet.Thanks so much! Cute! Cute! They're all beautiful but my favorite is probably happy churn dash followed closely by sweet starlet. Forgot my info... bellaroolambert at gmail dot com. Sorry. I love love love Sweet Starlet! I especially love Sweet Starlet. All of your patterns are lovely! Happy Zig Zag is my favorite, love the bunny too. I love the Promenade pattern! So pretty. I like Happy Churn Dash very much. I love your pattern, read your blogg evry time you write about new ting. Sorry for my writen but i from Norway. I like the Happy Churn Dash pattern the best. Thanks for the giveaway! One day perhaps you talk a bit more about what it is to "technically edit" a pattern? Sounds interesting! I like that Promenade pattern. I think my favorite is the Promenade patttern, but it is hard to choose since they are all so pretty! The hello zig zag one. Sweet Starlet, without a doubt! Sweet starlet my mom has a very old quilt top with a similar star pattern she reminds me all the time that she would like a quilt like her lap quilt for her bed. Thank you for the giveaway it is really nice of you. These all look great! My favorite is Hello Zig Zag! Thanks for the chance to win. 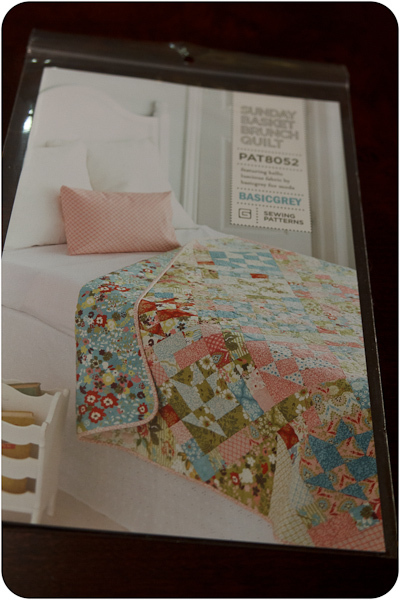 Wow, I have always loved BG...it was my favorite SB paper brand and is now one of my favorite fabric designers! 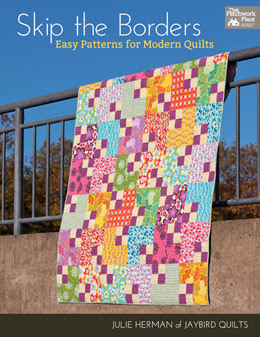 I love all of these patterns...they all look great, but maybe Sweet Starlet is the most scrumptious! They are all beautiful, but Sunday Basket Brunch is my favorite. I like the Sweet Starlet pattern based on what I can tell from the photos. I love the Promenade pattern. So pretty. I think the Happy Zig Zag is my favorite! What is it about people having giveaways that makes them want to make you choose a favorite and then they offer up more eye candy then you could possibly even begin to know what to do with it. 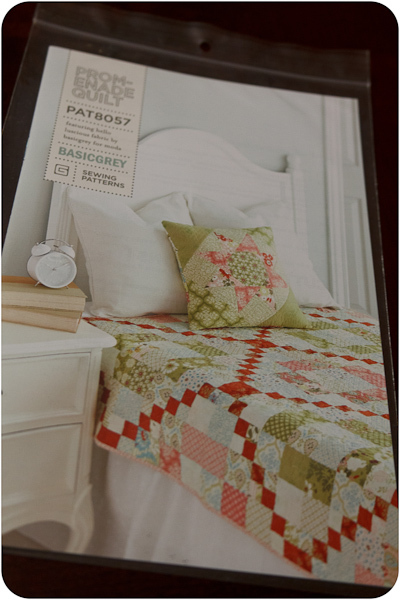 I love basic gray and have been a fan since I was a scrapbooker before I turned quilter. Did you know they make amazing paper products too. I'm so glad to see these patterns as they are simple and happy and yet just enough all at the same time. So I don't have a favorite but I guess if I was going to have to start somewhere it would be between Sweet Starlet and Promenade. Thanks for a chance to win. I really love them all but if I have to pick a favorite it's Sweet Churn Dish. I really love Promenade, great job Julie-they all look great! Happy Churn Dash! It has a classic look in contemporary fabrics. Love it! Oh my goodness - I LOVE them all!!! My absolute fave would have to be the Hello Zig Zag!!! So fun! Thanks so much for such a great giveaway Julie!!! love Promenade, well all look very good to me. Sweet Scarlet hands down my favorite. All of them are great. Promenade makes me happy! Thanks for the giveaway. I have had my eye on these! 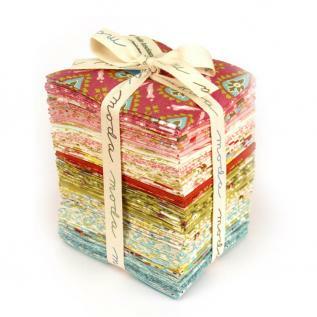 Promenade is my favorite and I just so happen to have a Hello Luscious bundle that would love to be made into one of these! Thanks for the chance! I really like the sweet starlet pattern. I'm a sucker for big stars. Congrats, they're beautiful! Wow, so hard to choose...I think Sunday Basket Brunch in my fav. Oh its so hard to pick. I'm torn between Happy Zig Zag and Promenade. I think I'll go with Happy Zig Zag. Thanks for the giveaway. Love the fabric too. They are all so appealing! If I had to chose one, it would be Sweet Starlet. I LOVE Basic Grey! First in scrapbook products and now fabric. I think Sweet Starlet is my favorite of the patterns. Sweet Starlet would be my first choice, thanks for the chance to win one of these fabulous patterns!! sweet starlet is my fav! love big blox and this is really great! thanx for the opportunity to win it. Sweet Starlet is my favorite!! How much fun for you to do the patterns! Love the fabric too!!! Love Promenade. Thanks for a chance to win! Happy Zig Zag is my favourite -- thanks for a great blog! My favorite is Promenade. Thanks for the chance! and I'm a big fan of Basic Grey. Just finished a quilt top using Sultry. All are yummy, but I like Sunday Basket the best!! Really hard to choose!! I think Promenade would be my favorite. Thank you for a chance to win, julie! ohmygosh, Julie...they are all wonderful! I think my fave has to be Sweet Starlet...that one takes my breath away! Thank you so much for the opportunity. I'm totally in love with Happy Churn Dash! I just love the Promenade pattern and the fabric - I am getting ready to make a quilt for our bed and have been trying to decide but I think this might be it, maybe! Love the Zig Zag pattern! The Hello Zig Zag pattern is my favourite. It is so simple yet so beautiful! Promenade! Love the pattern of orange through it. Wonderful to hear of your collaboration. And thank you for doing the give-away! I love the Sweet Starlet! Looks like so much fun to make! Wow! That's a tough choice, but I'll go with Churn Dash. Thanks for the giveaway. Sunday Basket Brunch is my favorite - though it was difficult to choose. Thanks for the chance to win. I love the zig-zag quilt. They are all lovely though! They are all wonderful, but i would have to pick the zig zag as my favorite. I would choose "Hello Zigzag" It looks really scrappy and has a controlled chaos look about it. Love It! Congratulations Julie! They all look lovely but my favourite is definitely Sunday Basket Brunch. Perfect combination of fabrics and design. I would choose Sweet Starlet, I love them all, but it had to be one that has King size as an option and that one is the nicest King size. I love them all and their fabric too. Promenade is my favorite one. Thanks for the give away! Oooh, it's a tie. But Hello Zig Zag wins out. They all look like fun! I love sweet starlet! But I really love them all, so beautiful and are great with the fabrics. 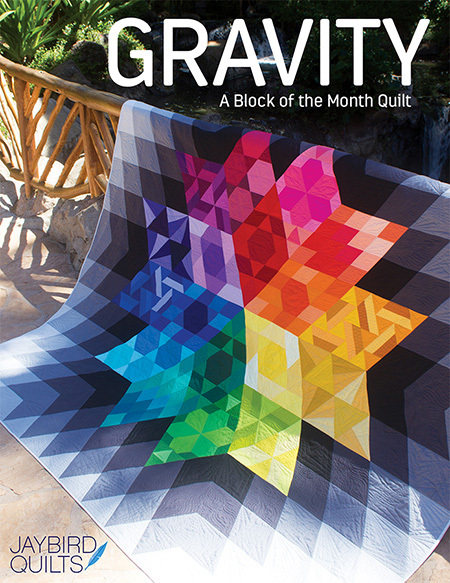 the zigzag quilt looks like one I want to make soon. Julie, I would have to start with Sweet Starlet and then dosido on over and do Promanade!! Love the giveaway, your patterns are great! Oh, it is so hard to pick just one favorite! But, if forced, I would say Promenade is that one that calls the loudest to me. Oh Jaybird written and Basic Grey fabrics is inspiring - my favourite is absolutely Sweet Starlet, sooooo cute! It was hard to pick just one, but i think 'Sweet Starlet". I am cutting something out from my jelly roll of Hello Luscious right now! I love it! Sweet Zig Zag Starlet? Hard to choose but guess Sweet Starlet! Thanks. Ooh, I think Sweet Starlet is my favorite!